Personalized Silk Fans add a decorative touch and make the perfect compliment to any wedding, promotion or special event. Custom printed silk fans are also a great way to spread your message and and will remain as a long lasting momento. Personalized Silk Fans - Custom Print on the Front of the Fan. 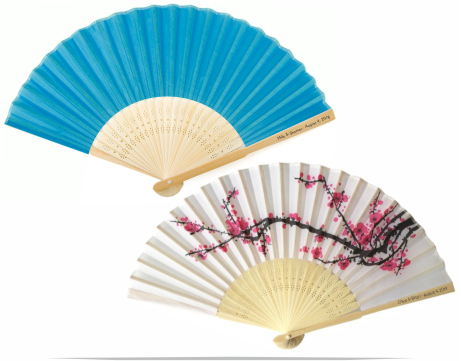 Folding silk hand fans are the perfect compliment to any promotional or special event. Economical, durable and long lasting, they will add a decorative touch to your event, and remain as a long lasting memento. 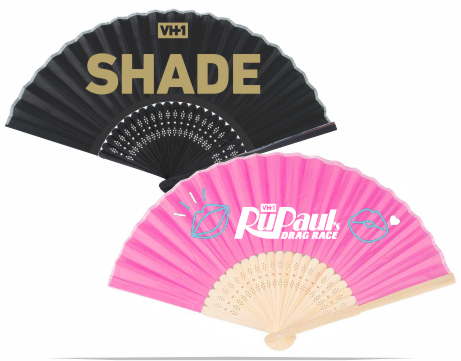 Personalize silk fans with your custom design printed ont he front of the fan, on one or both handles or on the on the front and the handles. Our decorative and custom printed fans not only make great favors and souvenirs for weddings and special events, but also work hard to promote your business and organization. Let us create your print ready artwork or design it yourself.